Article Written by John Kurlak for The Hacker News,He is senior studying Computer Science at Virginia Tech. Today John will teach us that How to Spoof the Source Code of a web page. 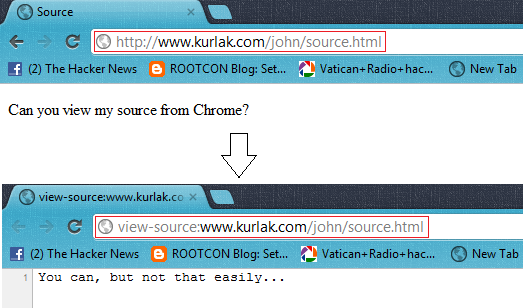 For example, Open http://www.kurlak.com/john/source.html and Try to View Source Code of the Page ;-) Can you View ?? First, I wanted to see if history.replaceState() supported changing the entire URL of a page, including the hostname. Fortunately, the developers were smart enough to prevent that kind of action. Next, I noticed that if I viewed the source code of a page after replacing the URL, it attempted to show the source code of the new page. I started brainstorming ways I could make the URL look the same but have a different underlying representation. Such a scenario would make it so that I could “hide” the source code of a page by masking it with another page. I remembered encountering a special Unicode character some time back that reversed all text that came after it. That character is called the “right to left override” (RLO) and can be produced with decimal code 8238. I tried to create an HTML page, “source.html,” that would use history.replaceState() to replace the URL of the page with: [RLO] + “lmth.ecruos” (the reversed text of “source.html”). When the browser rendered the new URL, the RLO character reversed the letters after it, making the browser display “source.html” in the address bar. However, when I went to view the source of the web page, my browser tried to view the source of “â€®lmth.ecruos” instead (the characters, “â€®,” are the ASCII representation of the hex codes used to represent the RLO character). Thus, I created a page, “â€®lmth.ecruos” and put some “fake” source code inside. Now, when I went to “source.html,” the URL was replaced with one that rendered the same, and when I viewed the source of the page, it showed my “fake” source code. Then, I simply had to create “source.htmlâ€­” and put my “fake” source code in it. It worked! Now the user could type normally without seeing anything funny. However, this new code still has two downfalls. The second downfall is that if the user tries to refresh the page, he or she will be taken to the fake HTML page. As far as I know, there is no sure way to prevent this side effect. Finally, I would like to point out that this “exploit” is just a cool trick. It cannot be used to prevent someone from retrieving the source code of a web page. If a browser can access a page’s source code, a human can access that page’s source code. Maybe someone else can think of a more interesting use of the trick. I hope you like it!